Product reports for Jackson Electronics products are now online and available over the Jackson Electronics Intranet. We will update the report list several times a week, so make sure you check in regularly for the latest information. You can retrieve the reports using your Web browser. Just click the Reports link on the Jackson Electronics home page. If you have any questions or problems with viewing online product reports, please contact Jeff Brooks at ext. 309 or through e-mail. The ScanMaster is clearly one of the big success stories of the industry. By creating a high-quality flatbed scanner targeted at the small business owner, we're succeeding in expanding the market for our scanner products. Based on sales from the first two quarters of the year, we've captured about 31% of our targeted flatbed scanner market. This makes four consecutive quarters that Jackson Electronics scanners have outsold their Photometric counterparts. Right now, we can proudly say that Jackson Electronics is the largest supplier of low to mid-cost scanners in the industry. The future looks bright. We estimate that ScanMaster sales will continue to grow through the final two quarters of the year. As sales of the ScanMaster continue to grow, we anticipate that there will be increasingly less demand for the Scan 100 series desktop scanner. By the end of the year we anticipate that 90% of our desktop sales will be for the ScanMaster series. Based upon our projections, we calculate that Jackson Electronics will have shipped 57,000 units by the end of year. The ScanMaster color/grayscale scanner is an affordable flatbed scanner that's quick and easy to use. You can scan color images, grayscale drawings, and text in a single pass. Single-pass scanning saves you time over multiple-pass desktop scanners. User-friendly software is included so that you can learn how to scan in minutes. The ScanMaster is ideal for creating new documents, converting existing documents, and capturing images and pictures to be used in high-quality presentations, pamphlets, and newsletters. It's ideal for desktop publishing, word processing, and presentation graphics. Use the ScanMaster in conjunction with your faxing and e-mail too. Best of all, the ScanMaster is backed by Jackson Electronics' rock-solid reputation for quality and reliability, so you know it's built to last. Plus it comes with a one-year warranty and a responsive service and support plan to keep you up and running. The ScanMaster scanner is affordable, easy-to-use, and built to last. This product is your small business scanning solution. The ScanMaster has received favorable reviews in all major publications, including PC Digest, Computer Views and Windows Today. It has received a Best Buy award from CPU Quarterly. The marketing plan for the ScanMaster scanner emphasizes its unique position in the industry: it provides a high-quality flatbed scanner at an affordable price. We are targeting primarily small business owners and home users. Combined with Jackson Electronics' less expensive handheld scanner, ScanBoy, and the more expensive flatbed scanner, UltraScan, Jackson Electronics has supplied key products for much of the scanning market. 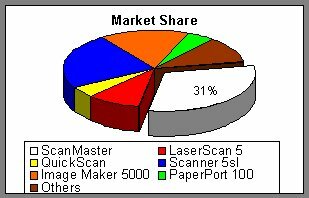 ScanMaster's competition comes primarily from Photometric's 5SL Scanner and Bronson Peripheral's Image Maker 5000. Both are retailing for about $75 to $125 more than the ScanMaster. However, we anticipate that both companies will close the gap later in the year with the introduction of new products. We are increasing the value of the ScanMaster by including some very useful software with the product. Bundled software includes: WordScan, one of the more powerful OCR software packages, ScanFile, which organizes scanned images, and Image Plus!, a powerful graphics program. ScanMaster was introduced last August at the popular DTPEX convention in Las Vegas, where it won rave reviews. Our sales reps are continuing to make presentations at the important trade shows. ScanMaster will be heavily promoted at the NextComp trade show in Memphis.